Otzma Yehudit chair says he tried to pursue joint list - but Yishai 'refuses to meet' amid fears both rightist parties won't make it. Otzma Yehudit chair Dr. Michael Ben-Ari explained Friday what has been keeping his party from a joint list with Eli Yishai's Yachad - Ha'am Itanu, a move called for by many given the likelihood indicated in polls that both parties may not pass the recently raised threshold running separately. "Eli Yishai refuses to meet with me," Ben-Ari wrote on Facebook, noting "thousands in the streets of the country ask me again and again 'why don't you run with Yishai? Why isn't there unity?'" The answer, wrote Ben-Ari, is that "for over a month and a half I have been asking for a meeting with Yishai to establish a technical joint list for elections without ideological identity," with the last caveat evidently a response to Yishai's sources claiming Ben-Ari would make their party be portrayed as "extremist" in the general media, as well as possibly complicating a coalition agreement with Likud. "That's the demand of the public, of logic and responsibility," continued Ben-Ari. "But he refused to meet with me, and insists on running alone, with his advisers telling him he 'will receive the voters of Ben-Ari.'" Explaining his campaign and contrasting it with Yishai's break from Shas, the Otzma Yehudit chair said "our campaign is ideological and didn't start due to some sort of conflict, but rather from devotion to principles. It's a shame that despite the polls Yishai insists on acting irresponsibly with a surprising refusal to meet me." Ben-Ari included several recent polls in the post as a "reminder" to Yishai, with the most recent polls showing that Yishai will not make it into the Knesset, whereas a joint list would have both parties comfortably enter with four to five seats. 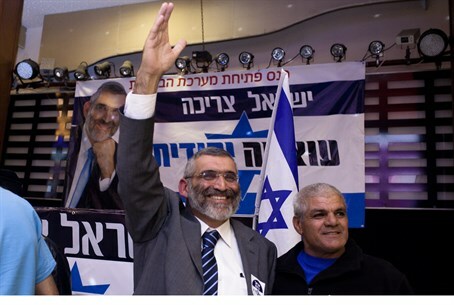 Earlier on Friday it was made known to Arutz Sheva that Yishai has evidently refused a joint list with Otzma Yehudit in talks with Kiryat Arba and Hevron chief rabbi Rabbi Dov Lior, who has supported Ben-Ari. Sources with Yishai told Arutz Sheva that they don't want to join with Otzma Yehudit fearing the media stigma of him as "extremist," given his call to deport hostile Arab radicals from Israel. Yishai apparently desires to join a coalition with Prime Minister Binyamin Netanyahu, with it estimated that Ben-Ari would oppose such a move unless clear ideological red lines were set, such as not releasing terrorists, not freezing construction, not holding negotiations with the Palestinian Authority (PA), and not letting Hamas survive another operation - all of which the outgoing coalition did.